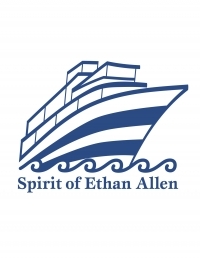 Spirit of Ethan Allen III, Lake Champlain's largest cruise ship carrying 363 passengers on three dining decks. Decks are enclosed, heated and air conditioned. On board galley featuring Executive Chef Steve B culinary delights. Various entertainment, food and beverage options are available. Enjoy Elvis, Murder Mystery, Italian Dinner and Dance or Lobstah-on-the-Lake dinner cruises while searching for Champ, the legendary Vermonster of Lake Champlain. When you need not just the ordinary but the extraordinary in an excessively entertaining setting for that special occasion and demand the best, give us a call! We operate April through early November. Vermont Discount Card bearer entitled to full price for first adult and 50% discount on second adult. Cannot be used in combination with any other offers. Not valid for Lunch, Dinner, Brunch packages. Narrated Scenic Cruises: 10:00 AM, 12:00 PM, 2:00 PM, 4:00 PM Running April - October 2018.